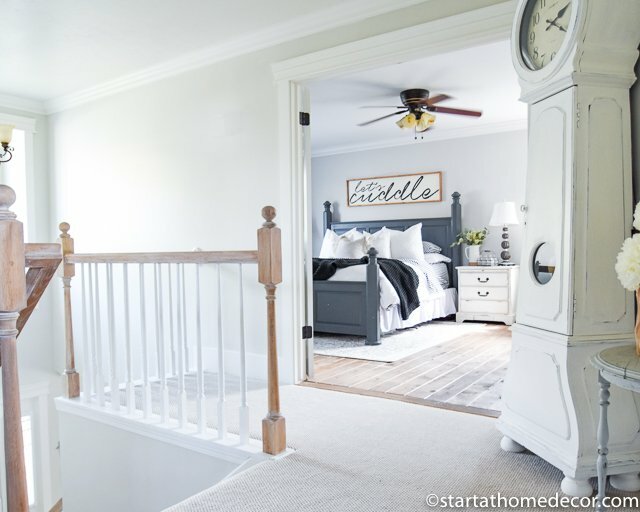 Out of all the rooms in your house, the master bedroom is the one place you want to be a personal sanctuary. It’s my own space where I can unwind and relax after a long day. 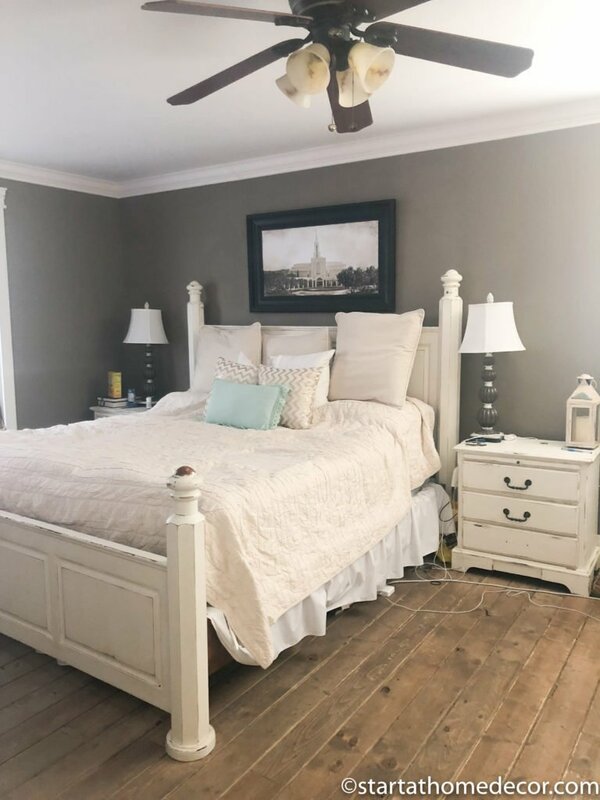 And, although it’s been some time in the making, I have finally finished and am now ready to share our master bedroom reveal. And here is my master bedroom now! 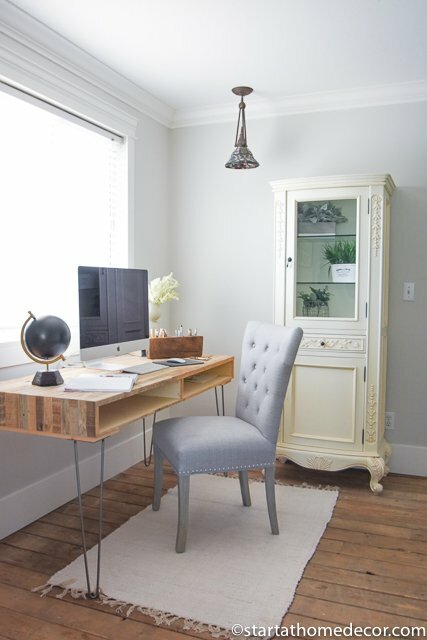 OFFICE NOOK – I love this small space in my bedroom. A lot of people opt for sitting areas, but I knew that I’d get the most use out of a desk area. 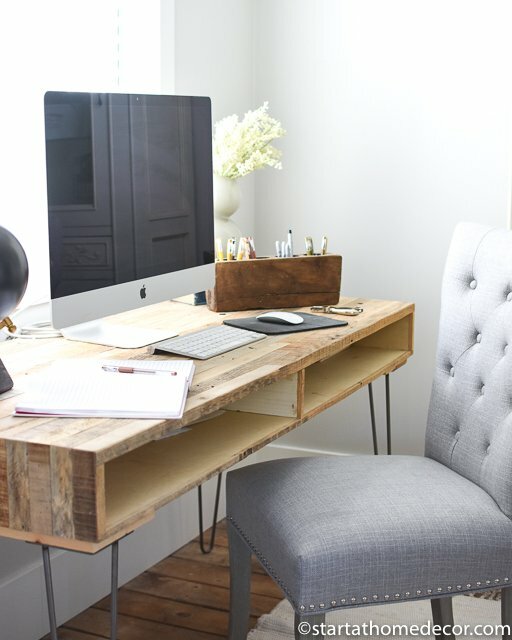 Did I ever tell you this desk is actually made by Clint Harp? I won it at Haven from Dremel a few years ago. Pretty awesome, right? I love the rustic-ness of the desk as it matches my floor and fits in perfectly with my themed bedroom. I wanted to pull the gray over to this area as well so I snatched up this chair! I just love my new bedding from Linens and Hutch. 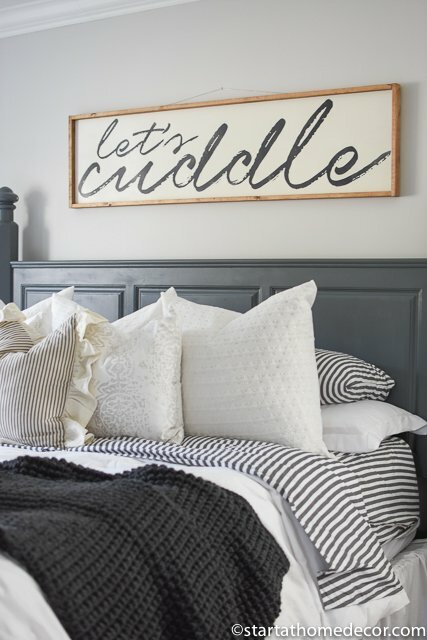 A fun way to add a little design into your bedding is to get a neutral comforter then accent with colored sheets. In this case, I got stripes and I love how they look with my white bedding. Linens and hutch’s duvet cover and sheets are so soft. I feel like I am in a hotel every night! 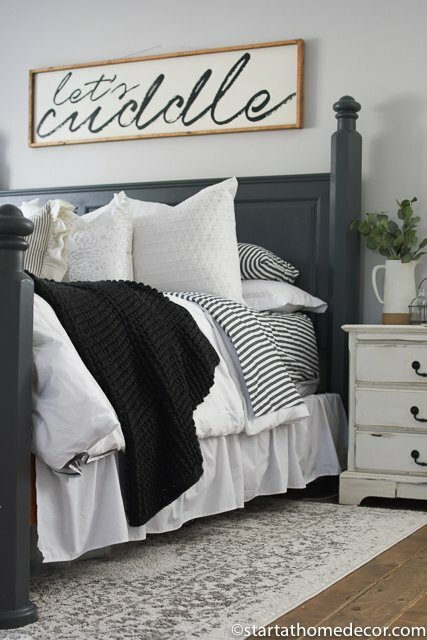 An accent blanket is always a fun accessory to throw on top. And it can bring in more color. My stepmom made this blanket for me, I love the texture it brings to the bed. 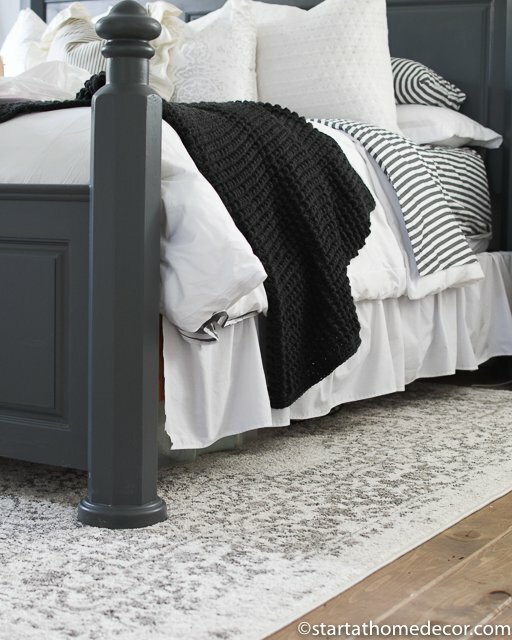 Let’s talk about this rug from Well Woven Rugs. It is the Mora Ivory Traditional Vintage Rug. It has such great color variations in it. There is some white, cream, taupe, gray and charcoal. I love rugs with variations because they pull everything together. 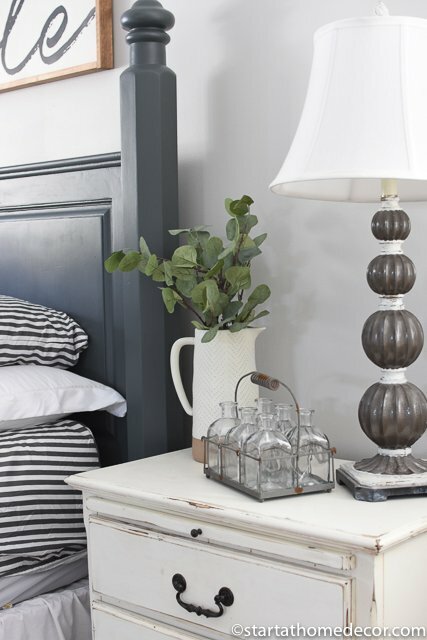 It bring the wood tones together with the whites and charcoals! I also love the vintage style of this rug. If by chance it happens to get dirty it doesn’t show nearly as much. Not to mention, this rug is super soft and well made! I painted my room with Crushed Ice by Sherwin Williams and my moldings are painted in snowbound by Sherwin Williams. 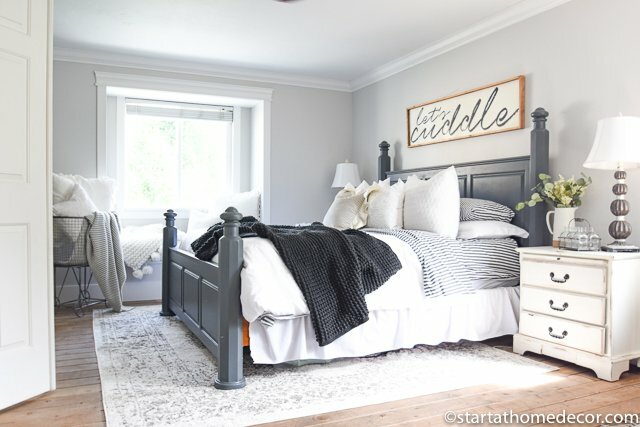 My master bedroom reveal turned out exactly how I hope it would. The space is bright and open, with neutral colors. Shop the Ribbon Duvet Cover Set here.